Union College hit the jackpot on its way to Tampa to play in the Frozen Four ice hockey championship. 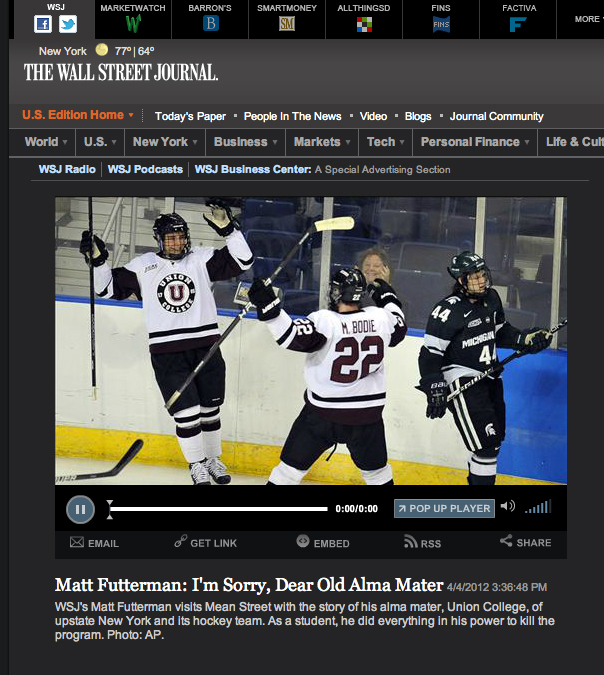 Matt Futterman, a Union College grad who now scribes for one of the top newspapers in the free world, the Wall Street Journal, wrote an op ed apology describing how wrong he was when he vehemently campaigned against the college’s reinstatement of the hockey program when he was an undergrad there 21 years ago. As a college senior, Futterman feared hockey was not a worthwhile pursuit for a college with the academic standards of Union. He describes his story HERE on the Journal’s web site. Good thing he has had a change of heart. Head Coach Rick Bennett has done a great job picking up where Nate Leaman, now at Providence College, left off. Winning at Union can’t be easy. I’d liken it to recruiting for sports at Stanford. There are only so many males out there who are really good athletes who can also score well enough on the ACAT/SAT in order to get in. And who are diligent enough students in the classroom who can stay in. In short, you’re looking for a special breed of cat. Apparently, they found enough of them to win at Union. My eyes were opened to Union when they played here in Minnesota during the Mariucci Classic tournament during the Christmas-New Years break in 2010. They beat the Golden Gophers in the tourney’s first game, 3-2 in OT. Understand something: The Minnesota fan base does not think their team should EVER lose to someplace called Union College. 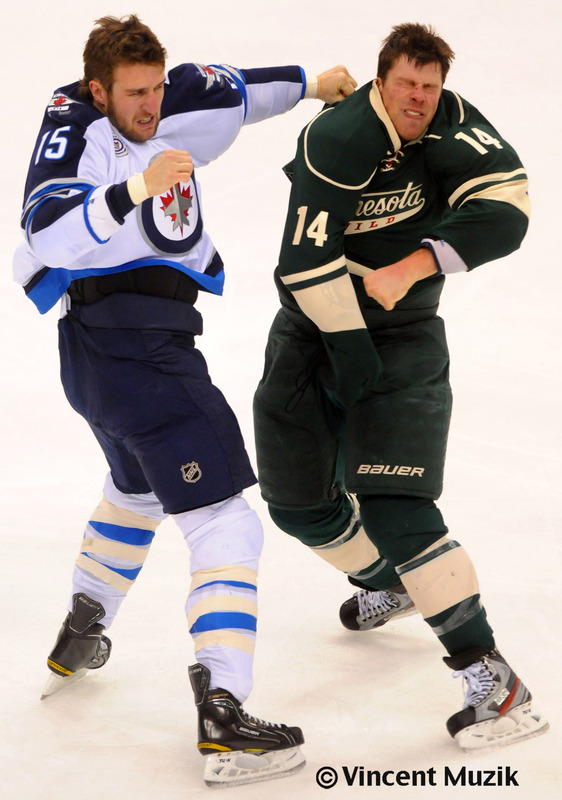 If we must lose sometime, we lose to brand names — North Dakota, Wisconsin, Boston College. Not Union. It was a big time wake up call for the Gophers, but more so for the rest of college hockey. Union may have it going, people. Having the Wall Street Journal run Mr. Futterman’s piece in the paper plus doing a video with him is icing on the public relations cake. First, dumb people do not read the Wall Street Journal. Opinion leaders do. Smart people, people in leadership, people who can donate financially and maybe even afford to send their kids to Union read the Journal. Secondly, everyone except the most callas of people like a Prodigal Son story. Instead of pleading insanity for being the son of a psychotherapist and a lawyer, Mr. Futterman takes full responsibility for being wrong, even going so far as to apologize in person and on camera to the past president, Roger Hull, who spearheaded the drive to get a hockey program back at Union. Generally speaking, people don’t like to admit they are wrong, let alone do it publicly. Watching the video on the Journal’s site, it’s hard not to like Mr. Futterman. “The troubling part of Mr. Futterman’s article is that it reads dangerously as a misinformed personal attack on the school,” Pearces asserts. Really? Union has its cadre of distinguished alumni to be sure, but lest’s be realistic: It’s not Harvard. In athletics it won’t remind you of Stanford either. The Wikipedia list maintained by Union itself is a little short on famous graduates since, say, 1960. It doesn’t mean Union isn’t a terrific school with wonderful people. However, as a contributing alum, Matt Futterman has done more to elevate the visibility of the school than President Chester A. Arthur has done lately. To use Mr. Futterman’s description of himself as a Union student, Mr. Pearce comes across as much of an “obnoxious punk” as Mr. Futterman was 21 years ago. Funny how history repeats itself. If I were Rick Bennett, I’d welcome back Matt Futterman with open arms. In fact, I’d give him a jersey and have him write a piece on the program for the team’s web site. After all, he just did your program a favor by acknowldging his youthful stupidity to about three million Wall Street Journal readers. A lot of those people never knew about Union College. Now they do. Way to go, Dutchmen!